While there is a lot of sofware that claims to convert Outlook email messages into PDF files, they vary greatly in their capabilities. Before purchasing any email-to-PDF software, consider exactly what you need to accomplish. Are you converting one email, or thousands? Do you want to work from within an email client like Microsoft Outlook, or outside of Outlook in a separate software package? Do you need to convert email file attachments into the image? Do you prefer to have the file attachments embedded within the PDF document, or extracted from the PDF file? Do you want to convert multiple emails into a single PDF file, or perhaps you even want to append emails to a single PDF document as you discover them? Is it important to give the resulting PDF files a specific file naming structure? Can the software handle emails that are themselves file attachments? Few affordable windows email conversion software packages can accomplish all of the above tasks reliably. Here are two that can. MessageExport by Encryptomatic LLC is a versatile add-in for Microsoft Outlook. It adds many new conversion capabilities to the Outlook menu system. MessageExport is simple to use. Start by selecting the email in your Outlook mail list that you want to convert. Next select the target export format from the MessageExport toolbar inside of Outlook. Finally, click the "Export" button to being the export operation. MessageExport has many options that let you tweak how it operates. For example, you can perform automatic email to PDF conversions from Outlook, set file naming criteria, call a batch file to run after the export operation, connect to Microsoft Sharepoint Server, and much more. MessageExport is us$79.99 for a single license. You can try it free for 15 days! Click here to learn more about MessageExport and download a free trial. PstViewer Pro converts Outlook email to PDF without Outlook installed on your computer. PstViewer Pro, also by Encryptomatic LLC includes most of the same capabilities of MessageExport, but functions independently of Microsoft Outlook. 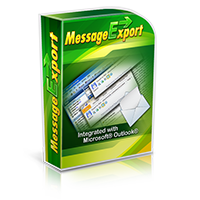 MessageExport not only reads Microsoft Outlook .pst files, but also .ost, mbox, .msg, .eml and .mht files. It can convert any of those email formats to PDF, as well as mixed email content. 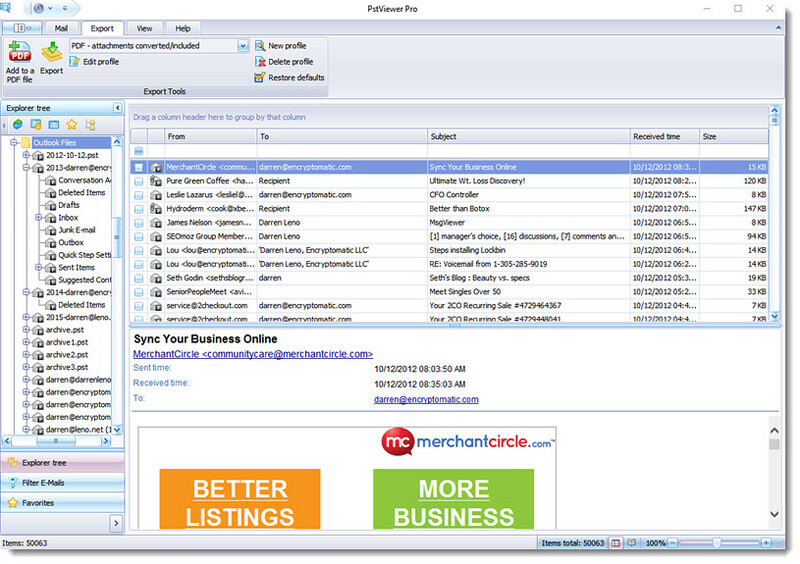 PstViewer Pro organizes your email into an Outlook-like mail list. Search to find the emails you want to convert to PDF and select them in the list. Select the PDF export format from Encryptomatic PstViewer Pro's list. From the "Export" tab, choose the PDF export profile that is best suited to your needs, or create a new one. Finally, click the "Export" button to start the conversion process. PstViewer Pro is us$69.99 after a 15 day free trial. Learn more about PstViewer Pro and download the free trial.